Yikes! A week has raced by already since our last post... I miss being able to spend the time writing up the dinners and treats we make each day. Such is life these days, especially with the extra time we're having to pay towards Dora. She's a great pup, but has become a bit protective of us around strangers and other dogs (to the point of being aggressive sometimes!) 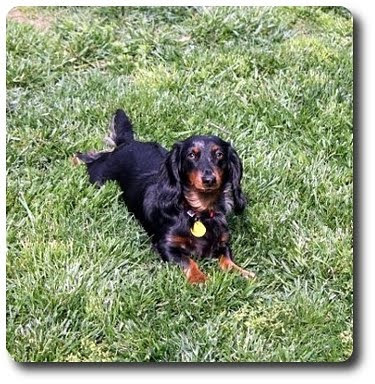 - since we have no idea about her history before we rescued her, we figured it would be best to nip this in the bud as quickly as possible. We've been working with an excellent and innovative trainer we found in our area and Dora seems to be taking to the teachings quite well - she is one smart cookie! Since it is Tuesday after all, you can bet I did get a goodie made for the Weekly Wednesday Treat Day we do for Jeff's co-workers. This one is a real doozy that I found while browsing foodgawker looking for inspiration and with a title of Sticky-Fingers Bars, how could I dare say no? 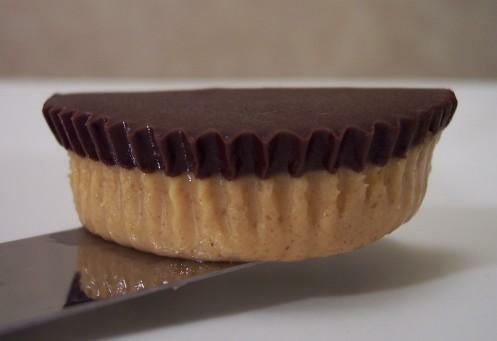 Especially since you know of my infatuation with chocolate and peanut butter! 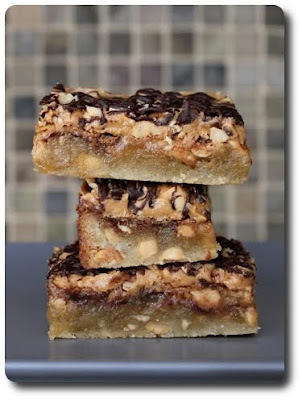 To get these dangerous treats going, the base was concocted by simply smashing together butter, sugar and plenty of sweet vanilla with a couple scoops of flour and chopped salted peanuts. 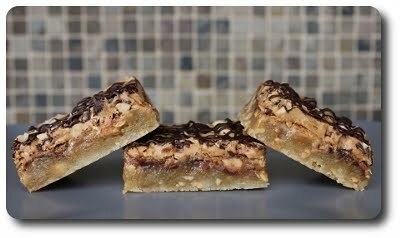 The consistency should be a little tacky, but not sticky - it should also not be dry and crumbly either. I was able to press the dough into the baking pan without it grabbing hold of my fingers or peeling out of the pan - if you do find yourself struggling with this, lay a piece of plastic wrap on top of the dough and let that barrier help you smooth it to an even layer. 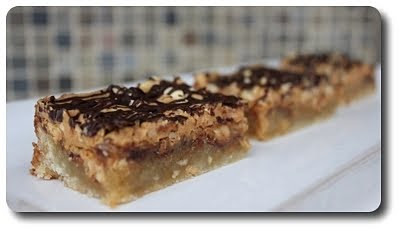 To ensure the shortbread crust bakes through, it will need to be pre-baked before topping it - slip it into the oven and let it go just until the top begins to turn golden brown. Once pulled out and left to rest for a few minutes, the crust is littered with a surprise ingredient - thinly sliced Snickers Bars! 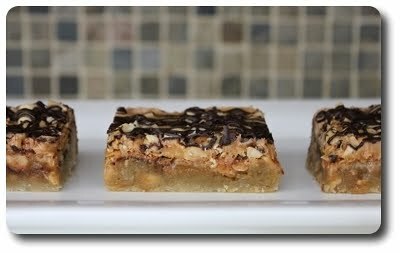 Not one bar, not two or even three - you'll need four full bars (though if you're anything like me, have a fifth bar around as a few slices may have accidentally ended up in my belly while cutting them!) to cover the top. Rather than dirty another bowl, I did use the same mixing bowl that we made the crust in to prepare the rich filling that covers the candy bars - less dish washing is always a plus! 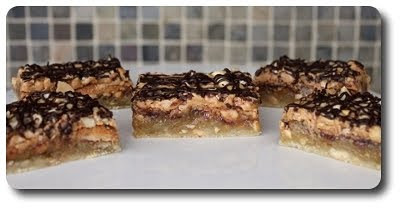 Consisting of eggs, granulated sugar, caramel-y Golden Syrup, a couple tablespoons of melted butter and a heavy glug of vanilla, the thick mixture is poured over the sliced snickers and baked until completely set. 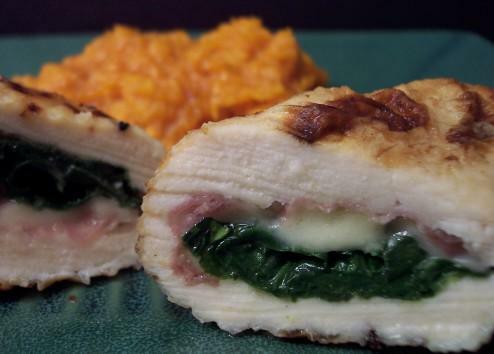 As in, the filling shouldn't have a loose jiggle when you take the pan out of the oven. If you'd rather not purchase the syrup (it can be pricey, but it is spoon-worthy good), swap it out for light corn syrup. 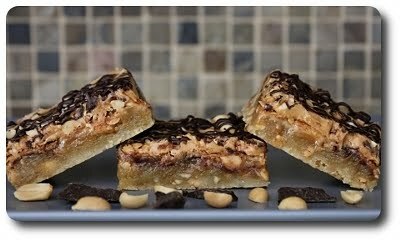 If that already was not enough, there is one more step to take these bars out of the galaxy - a smearing of slick creamy peanut butter, more of those crunchy peanuts and a psycho drizzle of melted bittersweet chocolate to finish them off. Now, I won't lie - these are diet busters. However, let me assure you they are worth every. single. lick-your-fingers-clean. calories they might have. Dora is just a cutie in that pic too. I just read the ingredients and there is Snickers, that must be a really yummy treat. I miss your regular postings, too!! Jan - I know, right? Helene - They did not last long at the office! Sandy - A fun treat indeed! We'll have to see if we can get back into our groove or not with the posting! Just thought I'd let you know I posted a pizza on my blog tonight that I linked to you and made with your whole wheat pizza dough. So good! Katrina - Thanks for letting me know! Oh, Joe! You come through yet again, as I've been looking for something truly decadent to take for the upcoming 4th of July weekend. Do you think these would freeze at all? I'd love to be able to make them ahead of time if we have a cooler day or two. Erika - I don't see why they wouldn't freeze. Just be sure to cut them, chilled, before freezing! merciful heavens! I'm making a note to buy Snickers bars after work!